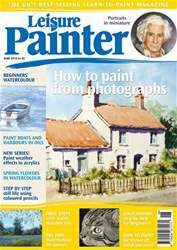 I would just like to say how much I look forward to each issue of Leisure Painter. I love Leisure Painter’s projects and exercises in old and new issues. A friend and I have an ongoing challenge each week. We select a magazine, pick a page at random and complete the painting in a medium of our choosing. Last week, my challenge was to tackle Rodney Kingston’s still lifes in acrylics from the September 2017 issue. Instead of using the System 3 acrylics he used, I thought I’d give my new Derwent 2B and 6B water-soluble Graphitone pencils a go, as I followed Rodney’s marmite jar demonstration.